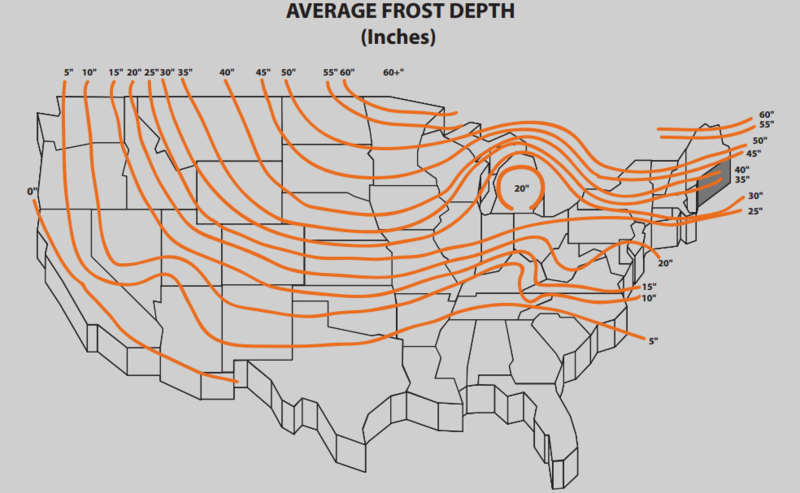 In this article, we will cover the Frost Line Depth in North America. 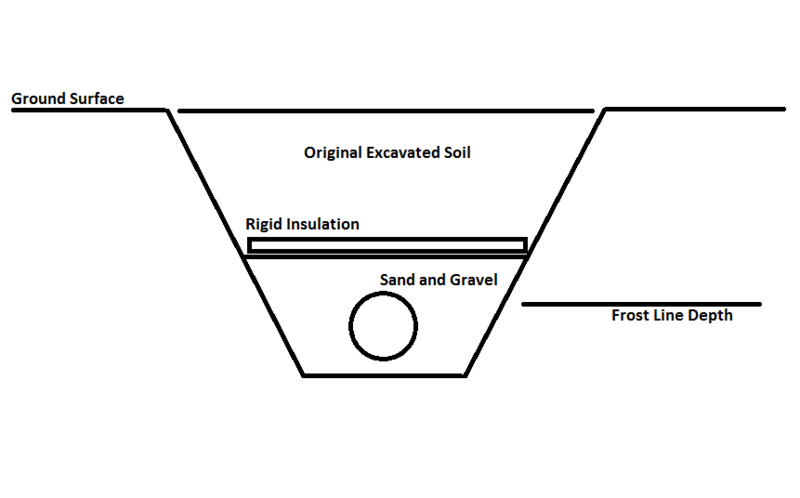 Frost Depth or Freezing Depth is the maximum depth within the soil, where groundwater is expected to freeze. The frost depth depends on outside temperature, the amount of insulating snow cover, the heat transfer properties of the ground material near the area in question, and any possible heat sources. 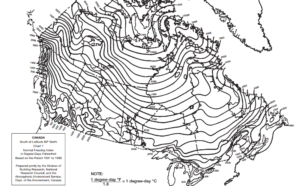 The Frost Line depth is affected by the presence of grass, asphalt, snow cover and man made objects, etc. With this in mind, if the area in question has a layer of asphalt, the frost will likely push deeper into the ground and travel below the normal frost line. If the area has a layer of grass or a thick layer of snow, the area will be insulated, and the frost will likely not travel to the depths of normal frost line. If you are forced to place a water line or anything that is subject to freezing above the frost line, you must install a layer of rigid insulation above the water pipe, to prevent the frost from penetrating deeper into the soil. 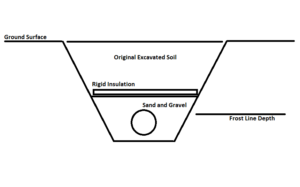 Depending on the soil, one inch of rigid insulation is equal to approximately one foot soil depth, therefore if the frost line for your area is 4 ft deep, and you are installing a water line at the 3 ft mark, you must lay 1" thick rigid insulation above the whole length the water pipe. 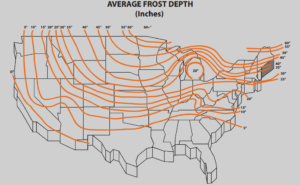 Knowing the depth of the frost line in your area is very important for many reasons, for example: depths of underground water lines, building foundation footing depths, concrete sonotube depths(for fences, decks, etc). 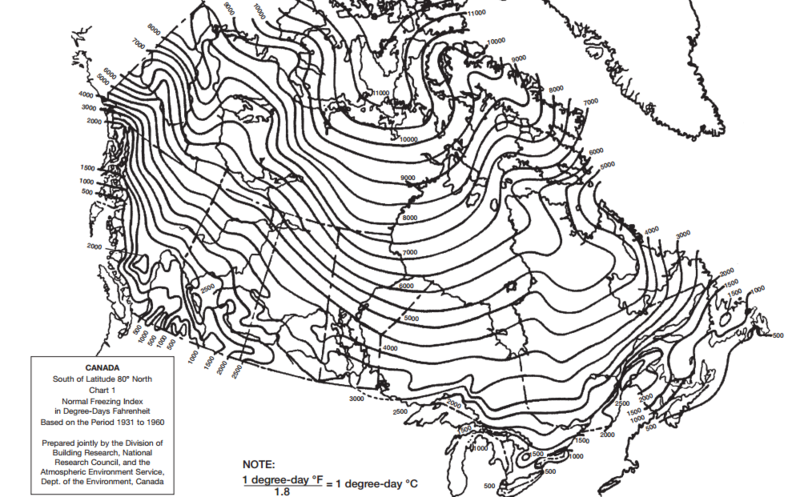 The following illustrations are the frost line depths for the United States and Canada.